Odd One Out: I see a red door and I want to paint it....Orange! I see a red door and I want to paint it....Orange! Well I think I have accidentally stumbled across a new, New Year tradition. 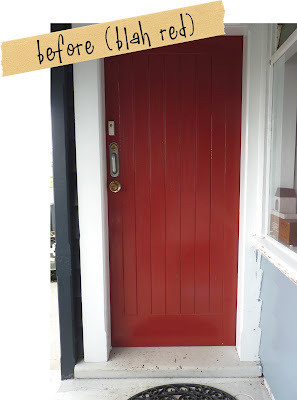 Right at the very start of this year we decided to repaint our front door. We were in the middle of repainting our whole house but suddenly it seemed important to get this done first - and what a difference it makes! Now I smile EVERY time I get home, it's more of a grin actually accompanied by an excited little shiver. I think this is definitely having a flow on effect in my happiness level this year - smiling as I enter my home, having that warm "love where I am right now" feeling - all from a door! I kid you not. Colour is something I take quite seriously, I have pretty strong opinions on it and I know Mr Odd One Out finds it extremely painful to watch me with piles of paint charts and test pots (of what he considers to be the same colour!) trying to get it just right. 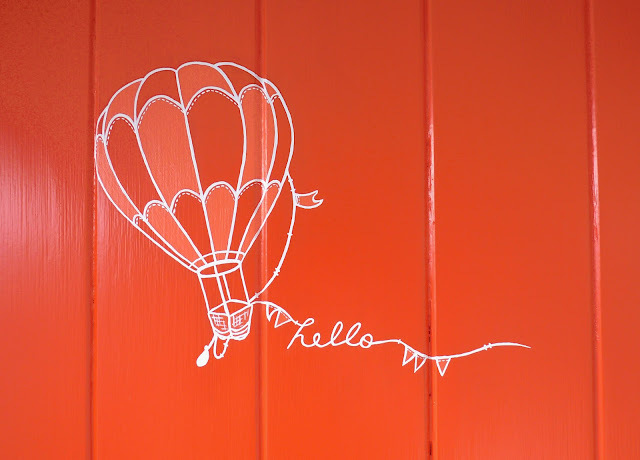 I just had a feeling that a dark tangerine / orange was where we should go with the door and what do you know, it turns out to be Pantone colour of the year too - awesome! 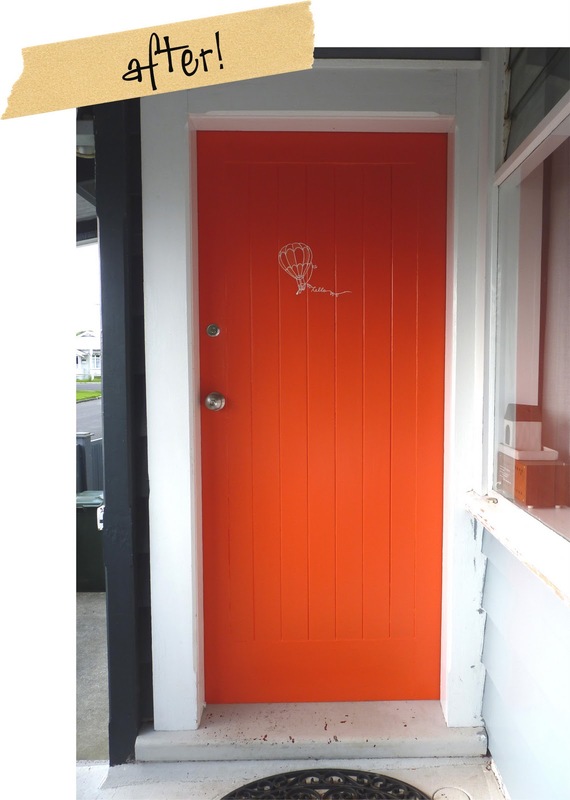 I couldn't leave gorgeous blank canvas like that alone so a couple of days later I painted on a little design from my sketchbook - it was supposed to go on a plate but I think it looks pretty cute on the door too! After it was all finished I thought I would have a little research into the symbolism of all of this - I think we pretty much hit the nail on head. Now I am really loving the idea that you can change your front door each year to attract your goals and dreams for the year ahead. What do you think? In Feng Shui they believe that your front door is where you set intention about yourself and about what you want; your entrance is a message to the world about who you are. It is thought to be the mouth of the home, the entry point where energy, abundance and opportunities may find us. Our door faces south west and apparently Orange is the perfect colour being a fire colour. Wicked! In Feng Shui the colour orange promotes lively conversation and good times. It is also the colour associated with fertility... hmmm not sure on that one! I love this quote from Wassily Kandinsky........ "Orange is red brought nearer to humanity by yellow"
I wanted to have a little picture on the door that would make people smile, with a little hello to make them feel welcome. The symbolism of these is interesting too. They also signify overcoming depression and are associated with the rising sun that starts the new day. They can represent the process of individuation and a quest to fulfill spiritual needs. An ascending balloon signifies frustrating conditions in your life in which you are seeking to rise above. It expresses a desire to escape and the need to acknowledge your inner child. So it sounds like by joining the two elements of Orange and my hot air balloon I was in fact subconsciously reaching for the same symbolism they bring. Already thinking about next years door! That is awesome :) I love what you wrote about the symbolism behind the hot air balloon, nice. the orange looks like it is definitely meant to be! it's perfect! p.s still smile every time i walk into my room and see my plates!